In chemistry, a base is thought of as a substance which can accept protons or any chemical compound that yields hydroxide ions (OH-) in solution. It is also commonly referred to as any substance that can react with an acid to decrease or neutralize its acidic properties, change the color of indicators (e.g. turn red litmus paper blue), feel slippery to the touch when in solution, taste bitter, react with acids to form salts, and promote certain chemical reactions (e.g. base catalysis). Example of simple bases are sodium hydroxide and ammonia. Sodium hydroxide (NaOH), also known as caustic soda or lye, dissociates in water to form hydroxide ions (OH-) and sodium ions (Na+). 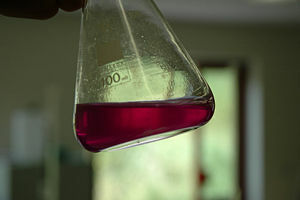 In a basic solution, phenolphthalein has a pink or red color. Bases have many practical uses, and several of them are commonly found in the home. Household ammonia is a familiar cleaning agent. Lye is used for cleaning clogs and sink drains. Potassium hydroxide, also called caustic potash, is used to make soft soap that dissolves in water with ease. Magnesium hydroxide in water (also called milk of magnesia) is used as an antacid or laxative. The term "alkali" is derived from the Arabic word al qalīy, meaning "the calcined ashes." These plant ashes were regarded as having properties such as the ability to reverse the action of acids and having detergent power. Thus, an alkali was initially thought of as the antithesis of an acid. The formation of salts from the acid and alkali reaction led to the view that salts can be derived from two constituents of opposite natures. Yet, not all non-acidic constituents possessed alkaline properties. Examples are oxides and hydroxides of heavy metals. Hence, the concept of "base" was born. This concept was first introduced by the French chemist Guillaume François Rouelle in 1754. He noted that acids—which in those days were mostly volatile liquids, such as acetic acid—turned into solid salts only when combined with specific substances. These substances formed a concrete base for the salt, and hence the name. The terms "base" and "alkali" are often used interchangeably, because most common bases are alkalis. It is common to speak of "measuring the alkalinity of soil" when what is actually meant is the measurement of the pH (base property). Similarly, bases which are not alkalis, such as ammonia, are sometimes erroneously referred to as alkaline. Note that not all or even most salts formed by alkali metals are alkaline; this designation applies only to those salts which are basic. Any base that is water solubleAlkali, Farlex, 2008. Retrieved April 8, 2008.</ref> This is more accurately called an Arrhenius base. The solution of a base in water. Acids and bases form complementary pairs, so their definitions need to be considered together. There are three common groups of definitons: the Arrhenius, Brønsted-Lowry, and Lewis definitions, in order of increasing generality. Arrhenius: According to this definition, an acid is a substance that increases the concentration of hydronium ion (H3O+) when dissolved in water, while bases are substances that increase the concentration of hydroxide ions (OH-). This definition limits acids and bases to substances that can dissolve in water. Around 1800, many French chemists, including Antoine Lavoisier, incorrectly believed that all acids contained oxygen. Indeed the modern German word for Oxygen is Sauerstoff (lit. sour substance). English chemists, including Sir Humphry Davy at the same time believed all acids contained hydrogen. The Swedish chemist Svante Arrhenius used this belief to develop this definition of acid. Lewis: According to this definition, an acid is an electron-pair acceptor and a base is an electron-pair donor. (These are frequently referred to as "Lewis acids" and "Lewis bases," and are electrophiles and nucleophiles, respectively, in organic chemistry; Lewis bases are also ligands in coordination chemistry.) Lewis acids include substances with no transferable protons (i.e. H+ hydrogen ions), such as iron(III) chloride, and hence the Lewis definition of an acid has wider application than the Brønsted-Lowry definition. The Lewis definition can also be explained with molecular orbital theory. In general, an acid can receive an electron pair in its lowest unoccupied orbital (LUMO) from the highest occupied orbital (HOMO) of a base. That is, the HOMO from the base and the LUMO from the acid combine to a bonding molecular orbital. This definition was developed by Gilbert N. Lewis. Litmus test: Bases turn red litmus paper blue. A general equation can be written for the acceptance of H+ ions from water by a molecular base, B, to form its conjugate acid, BH+. The equilibrium constant Kb is also called the Base Ionization Constant. It refers to the reaction in which a base forms its conjugate acid by removing an H+ ion from water. For example, if 1 mole of sodium hydroxide (40 g) is dissolved in 1 litre of water, the concentration of hydroxide ions becomes [OH−] = 1 mol/L. Therefore [H+] = 10−14 mol/L, and pH = −log 10−14 = 14. The basicity constant or pKb is a measure of basicity and related to the pKa by the simple relationship pKa + pKb = 14. A "Strong Base" is one which hydrolyzes completely, deprotonating acids in an acid-base reaction, hence, raising the pH of the solution towards 14. Compounds with a pH of more than about 13 are called strong bases. Strong bases, like strong acids, attack living tissue and cause serious burns. They react differently to skin than acids do so while strong acids are corrosive, we say that strong bases are caustic. Common examples of strong bases are the hydroxides of alkali metals and alkaline earth metals like NaOH and Ca(OH)2. Very strong bases are even able to deprotonate very weakly acidic C-H groups in the absence of water. Superbases are a class of especially basic compounds and harpoon bases are a special class of strong bases with poor nucleophilicity. The cations of these strong bases appear in groups 1 and 2 of the periodic table (alkali and alkaline earth metals). A "Weak Base" is one that does not fully ionize in solution. When a base ionizes, it takes up a hydrogen ion from the water around it, leaving an OH- ion behind. Weak bases have a higher H+ concentration than strong bases. Weak bases exist in chemical equilibrium in the same way weak acids do. The Base Ionization Constant Kb indicates the strength of the base. Large Kbs belong to stronger bases. The pH of a base is greater than 7 (where 7 is the neutral number; below 7 is an acid), normally up to 14. Common example of a weak base is ammonia, which is used for cleaning. Bases can be thought of as the chemical opposite of acids. A reaction between an acid and base is called neutralization. Bases and acids are seen as opposites because the effect of an acid is to increase the hydronium ion (H3O+) concentration in water, where as bases reduce this concentration. Bases react with acids to produce salts and water. A strong acid HCl (hydrochloric acid) reacts with a strong base NaOH (sodium hydroxide) to form NaCl (salt = sodium chloride) and water. If the amounts of the acid and the base are in the correct stoichiometric ratio, then the reaction will undergo complete neutralization where the acid and the base both will lose their respective properties. A strong base NaOH (sodium hydroxide) added to a weak acid CH3COOH (acetic acid) in 1L of solution, forming NaCH3COO (sodium acetate) and water. Weak bases react with strong acids to form acidic salt solutions. The conjugate acid of the weak base determines its pH. For example, NH3 (ammonia) is added to HCl (hydrochloric acid) to form NH4Cl (ammonium chloride). As soon as the salt is formed it reacts with water, resulting in a slightly acidic solution. Since Ka(NH4+) > Kb (F-), the reaction of ammonia with water is more favorable. Therefore, the resulting solution is slightly acidic. magnesium hydroxide is an example of an atypical alkali: it is a weak base (cannot be detected by phenolphthalein) and it has low solubility in water. Soil with a pH value higher than 7.4 is normally referred to as alkaline. This soil property can occur naturally, due to the presence of alkali salts. Although some plants do prefer slightly basic soil (including vegetables like cabbage and fodder like buffalograss), most plants prefer a mildly acidic soil (pH between 6.0 and 6.8), and alkaline soils can cause problems. In alkali lakes (a type of salt lake), evaporation concentrates the naturally occurring alkali salts, often forming a crust of mildly basic salt across a large area. In addition to their uses in industries, bases have many applications around the home. Antacids are used to neutralize stomach acidity; gardeners use bases such as Lime (CaO) to make soil more basic. Mild bases are used to clean everything from dishes and clothes to vehicles and the family dog. An antacid is a base that is used to neutralize excess stomach acid. The recommended dose is the amount of base required to neutralize some, but not all, of the stomach acid. Most cleaning compounds such as dishwashing detergents, scouring powders, laundry detergents, and oven cleaners are basic. Many decades ago homemade lye soap was used to clean clothes as well as people's skin. The closest thing to lye soap we see today is dishwashing detergent. Really tough cleaning jobs around the home require chemically aggressive cleaners. Highly basic cleaners are used to get rid of dirt, grease, or stains. Drain and oven cleaners are at the other end of the pH spectrum, having pHs of 12 or higher. They usually contain a strong base such as NaOH that reacts with fats and grease to form a soluble soap. All strongly basic solutions, both in the lab as well as in homes are hazardous and should be handled with caution at all times. ↑ William B. Jensen, "The Origin of the Term Base," Journal of Chemical Education, 1130 83(8) (August 2006). ↑ Alkali, Lexico Publishing Group, LLC. Retrieved April 8, 2008. ↑ Alkali, Tiscali, 2008. Retrieved April 8, 2008. ↑ Acids, bases and salts, KryssTal, 2005. Retrieved April 8, 2008. ↑ A substance that can accept a pair of electrons to form a new bond. ↑ A substance that can donate a pair of electrons to form a new bond. ↑ A chemical compound or group that is attracted to electrons and tends to accept electrons. ↑ A chemical compound or group that is attracted to nuclei and tends to donate or share electrons. ↑ Capable of burning, corroding, dissolving, or eating away by chemical action. ↑ A hydrated hydrogen ion, H3O+. Also called hydronium ion. ↑ The ion OH-, characteristic of basic hydroxides. Also called hydroxyl ion. ↑ J. W. Moore, C. L. Stanitski, and P. C. Jurs, 2002, Chemistry The Molecular Science, New York: Harcourt College. McMurry, J., and R. C. Fay. 2004. Chemistry (4th ed.). Upper Saddle River, New Jersey: Prentice Hall. ISBN 0131402080. This page was last modified on 13 May 2016, at 21:04.